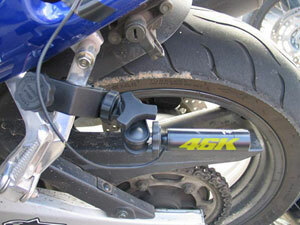 motorcycle camera, motorcycle cam, 46kam motorbike camera, motorbike cam, motocycle cameras, motorbike cameras. 46Kam is a motorcycle camera and a partner brand of 4Kam. 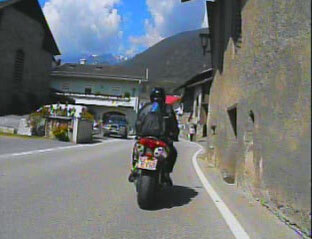 Get a bike cam for your motorbike today! 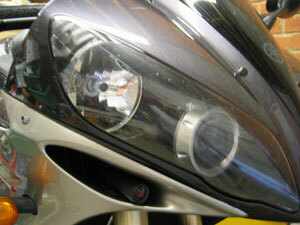 Motorcycle Camera Guide - NEW! Our Motorcycle Camera Setup Guide is online now. 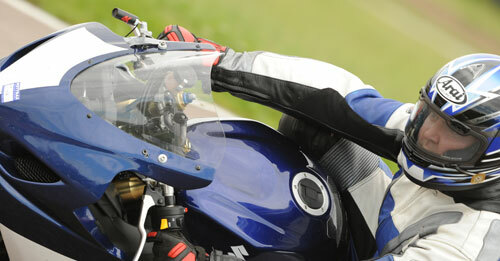 Take a look below for all our latest recommendations for fitting cameras to your bike. If you're looking for an onboard motorcycle camera system that includes everything you need to start filming then consider one of our 46Kam Motorcycle Camera Packages. It comes complete with our 46Kam bike camera, mini DVR (digital video recorder), free microphone and accessories. All for just £189! Buy any of our packages and know that you can get a full range of add-ons and accessories to match. Everything is compatible so if you want to get a special mount or upgrade to a 2 or even 4 camera system at a later date you can, no problem! We actually offer a complete dual camera system that's ready to go so if you want to get flashy and have a front and rear bullet camera on your motorcycle then our Dual Camera kit is the way forward! We are pleased to announce the launch of 'BikeAmigo' a much talked about piece of motorcycle safety equipment. BikeAmigo is a camera system that automatically records your ride and can provide video evidence in the event of an incident. Find out more here. Get serious with our very latest Bike Camera Pro package. Includes 46Kam Bike Camera, DV4 video recorder and remote control to mount on your tank or handle bar. You can also power everything from the bike if desired too! Yes its the future already! Say goodbye mirrors and hello rear view bike camera! If you want to jazz up your show bike or fancy feeling that bit safer when out riding checkout BikeEye, the wireless rearview bike camera from 4KamVU. 46Kam signed up by MCN! 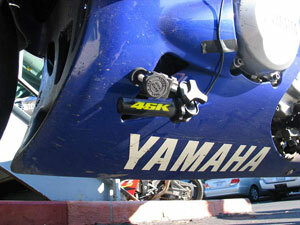 Yes 46Kam motorcycle cameras are now helping Motorcycle News produce their online video content. They'll be using them for bike tests and other such features! 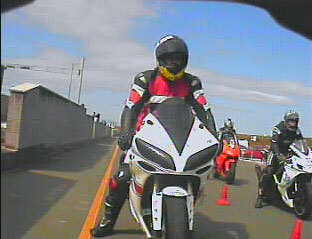 46Kam Bike Cameras at the TT! If you're heading to the Isle of Man for the TT don't forget to take your motorcycle camera! We almost ran out of them last year due to the demand with the TT looming. They'll be in action again this year in the main races and also the sidecars too, not forgetting all you crazy folks out there on Mad Sunday looking to get a bit of footage! We've got the little suckers! Our new suction mounts are now the answer to mount your new bike camera on your motorcycle without making holes in it or plastering it with tape! They'll stick to any clean glossy surface and hold on at some very high speeds! Our new 46Kam Motorcycle Camera Package is the on board camera system every amateur motorcyclist has been waiting for. Complete camera systems are now available for less than £200! Find out more here. If you've been waiting for our new ' Power Microphone ' to be launched then good news is here! The power mic for use with our bullet cameras specially designed to handle audio from loud bikes is now available at just £25. Can you see where it is yet? 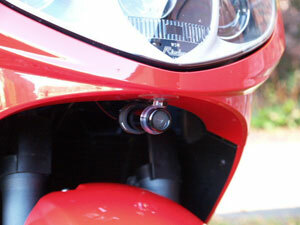 Bullet style camera systems are the most widely used and best recommended for anyone wishing to film on-bike video. They are both small and light and so offer the safest method of mounting a camera on your bike, they are also fully legal for track days. So you want to film some on-bike footage? People have tried many ways to get video footage from a bike perspective. Attaching a full size video camera is quite cumbersome so a bullet camera is usually the chosen method. Just watch MotoGP! First things first, what are you looking to film with the camera? If you are looking to capture normal ride footage with the camera looking up the road then our standard 46Kam camera is ideal as the zoom level on the lens is optimised for this purpose. If on the other hand you wish to capture the speedo dials, an arty MotoGP camera angle (as below) or want to capture other views in close proximity such as the suspension movement then the special 46Kam WIDE camera will be the best choice. 46Kam WIDE has a special wide angle lens making it better for use in certain positions such as those just mentioned. It could be used in an 'up the road' position but the wide lens will tend to make objects appear further away than in reality. Where should you mount the camera? Well you could go for a helmet camera style position or mount it on the bike itself. - Helmet mounted - If you are looking to get a POV perspective then the helmet cam position is best and can really make for interesting video. We recommend you have the camera on the left or right of the helmet, you can have it on the top too but the camera will probably be get covered up when you open your visor. - Motorcycle mounted - There are a wide variety of options here but under the headlight seems the most logical place. This will give you a good view up the road and is not so obvious should the rozzers pull you up... You can also mount the camera in an air intake, on the front fork or anywhere else on the bike fairing's, just ensure it has a clear view up the road! What is the best way to attach the camera? Well there are a wide variety of mount styles to choose from when mounting including fixed, suction and clamp, see the range here. A clamp style mounting such as the Super Multi Mount can give you a little more creativity in where you mount the camera and therefore the angle at which the camera is positioned. Remember the further the camera sticks out from the bike the more strain it will be under from the wind at high speed (and the easier it can be caught or knocked!). However you use it ensure it is well tightened as otherwise your video could come to a premature end! 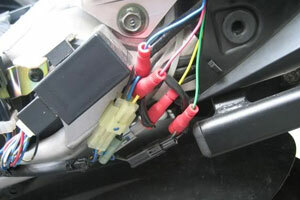 Now your new motorcycle camera is in position it will need some power. Our cameras come supplied with a battery box to take 8 x AA batteries, this will provide a 12 volt power supply to the camera and with good batteries should run the camera for around 6 - 8 hours. 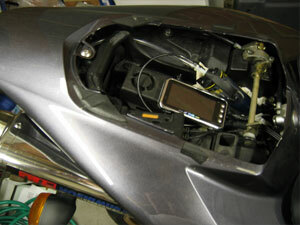 If you are looking for a more permanent solution then you can actually power the camera directly from the bike itself. Using the correct cable you can tap into the 12v supply anywhere on the motorcycle and this will run the camera indefinitely. Where should you connect into? Well that all depends what motorcycle you have got, the lighting circuit is normally the easiest to tap into or somewhere else on the wiring loom, some bikes actually have unused power feeds floating around so check with experts on your particular year and model. If you do decide to connect directly to the battery or any other unregulated supply source then we recommend you fit a voltage regulator. An unregulated supply could cause interference with your video and in the worst case result in damage to your camera. If you are unsure check with an expert but normally tapping into a positive and negative connection on the bike is pretty simple. If you don't fancy using the 12v supply from the motorcycle electrics but want an alternative to Duracell style batteries then a rechargeable lithium style battery may be the answer. Our XPower battery is smaller and lighter than the conventional batteries, and being rechargeable will work out cheaper over a season too. This is an ideal solution if you are wanting to mount the camera on your helmet or elsewhere on your person as a mini lithium battery will easily slip into a pocket. If you are using a mini DVR (see below) such as our DV3 or DV4 unit and want to power the whole shebang from the bike we have the parts available. You will simply need the 5v adapter for the DVR and a power splitter cable. So far we have a mini bullet camera mounted and powered. The bullet camera will act as the 'eye' to your on-bike videos but cannot not actually record what it sees, it needs to be connected to another piece of equipment which will save the video footage. Any device which with an 'AV-in' socket will work as a recording device, AV-in means Analogue Video Input, many camcorders offer this as well as number of digital video recorders (DVR's). If you think you might have a suitable camcorder check our list of camcorders with av-in. 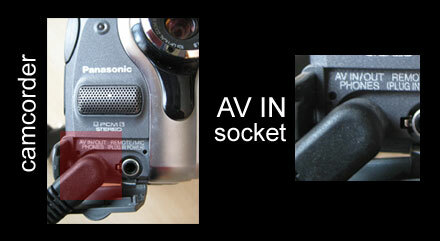 If your camcorder has an AV-in socket similar to the one shown in the photo above it will make a suitable recording device for the bullet camera. Although camcorders make a suitable recording device they are often quite bulky so you may wish to consider a smaller alternative. A digital video recorder (DVR) is a popular choice for many video enthusiasts, not only are these much smaller than a camcorder but the latest versions are 'solid state' by design and have no moving parts. Because of this they are much more tolerant of shocks and vibration and therefore more suited to motorcycle sports videos. We offer range of solid state DVR devices which can be seen here. Size comparison of camcorder and solid state 4K DVR. If you plan on using your videos on a computer, whether to edit them, add music or even upload them to the internet, a mini DVR is highly recommended. 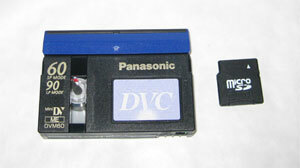 This is because they will record your video as computer file (eg video.avi ) to a small memory card making it easy to access the file on your computer. What ever video recording device you choose you'll need to keep it somewhere on the bike. There are many options but the most popular are probably under the rear seat or in a tank bag (allowing easy access). If you are wanting a helmet cam perspective then always mount the recorder on your person as wiring yourself to the bike is not recommended! The small solid state DVR's are best for this as being they can easily be slipped into your pocket, much like a mobile phone. If you are looking to purchase a complete, ready to use bullet camera kit for your motorcycle then you can view our range of bike camera packages here. 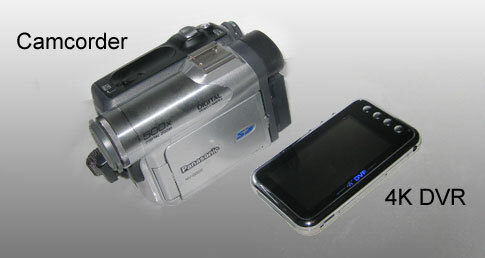 The information above refers to a standard 1 camera and 1 recorder configuration. For some customers that is all that will ever be needed but many customers like the ability to film from from more than one camera during a ride. As all our equipment is completely expandable and upgradable you don't need to decide on everything straight away, further parts can be added to your kit at a later date. The most popular multi camera configuration is to have one on the front and one on the back. The cameras are operated by a switch mounted on the tank or handle bars enabling you to choose the camera between the cameras as you ride. The camera selected will be the one fed into the recorder and therefore the one recorded. If you are really serious about your filming you many wish to have up to 4 cameras mounted on the bike. You can do this via our Quattro camera processing unit which can be operated via remote control or set to work automatically. The quattro unit will allow each camera to be selected independently as a 'full screen' shot (similar to the switched system above) or will allow for a 'picture in picture' configuration using 2 or 3 cameras. Other options include quad view or a 2 camera split screen. If you are interested in multi camera configurations then a complete 2 camera switched kit is available here. If you wish to wait and upgrade at a later date then we offer add-on packages to turn your kit into a 2, 3 or 4 camera configuration here. We hope this guide has been informative and has helped you understand the world of bike cameras a little more. While there is a variety of different equipment on the market these days none has the depth or versatility that 46Kam system offers. We have been providing cameras for motorcyclists for over half a decade now and most equipment bought by our very first customers is still compatible with our very latest developments. Be it extra cameras, the latest model of DVR or our ever widening range of accessories, making a purchase with 46Kam means longevity and expandability of your kit making it more useable and even better value in the long term. If you need further tips or have advice on how we can make this guide even better please drop us an email. 46Kam offers a range of bike camera equipment to suit the needs of both sports enthusiasts and TV production personnel alike. 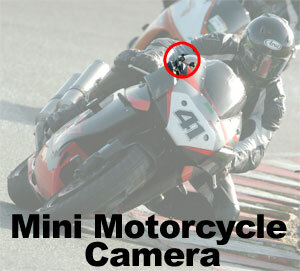 We've been working with mini bike cameras and onboard cameras for many years so we know just what it is you're looking for. Almost all 46Kam products are our own design and specification so you can be sure its just right for the job. Among our other products we have a range of 'Action Ready Packages™' on offer which are ideal if your looking for a full kit. We also have a wide range of accessories too. The following text will explain a little more about what to look for when buying a bike camera. Although it will be referred to as a Bike Camera, a Motorcycle Camera, Bike Cam or Onboard Camera will perform in the same way. How do Motorcycle Cameras Work? Put simply a bike camera is effectively an 'eye'. For the eye to be able to remember what it sees you need a 'brain'! Now we don't sell brains exactly but what we do offer is a mini recording device, our DVR. 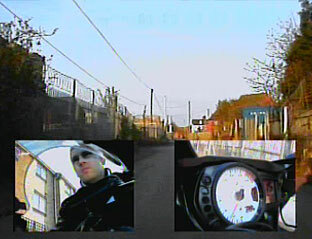 The DVR (Digital Video Recorder)is connected via a cable to the helmet camera, the DVR will record what the camera sees. There are a number of alternative recording devices that you could use as anything with an analogue input (av-in) will actually work. It's important though (especially if you are doing extreme sports) that the recording device you use is a 'solid state' recorder. If it isn't the recording may get corrupted if the device is subjected to vibration. For more information on this check out our FREE MOTORCYCLE CAMERA GUIDE! Why is the Motorcycle Camera separate from the DVR? Your camcorder has both the 'eye' and 'brain' in one case doesn't it? We could do this with a helmet camera too but it would be much bigger and heavier making it hard to mount on your helmet or the chain stay on your motorcycle for example. By keeping them separate the bike camera can be small and light making it not only easier to mount but less likely to get damaged in an accident. If you are unlucky enough to crash the footage of your 'wipe out' is safe as whatever happens to the helmet camera the DVR will be safely tucked elsewhere out of harms way! If you have an accident using your 46Kam Bike Camera or 46Kam Motorcycle Camera which causes it to be damaged beyond repair you won't have to pay the full price for a new one! 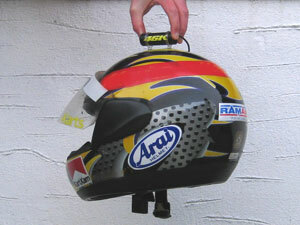 Just contact us and we will arrange to supply you a replacement helmet camera at 50% off the RRP. Its unlikely you'll ever need this as Bill Callister will demonstrate but it is worth bearing in mind! Bill Callister tried his best to write off his 46Kam Bike Camera at Cadwell but with little success - Here's what Bill said! 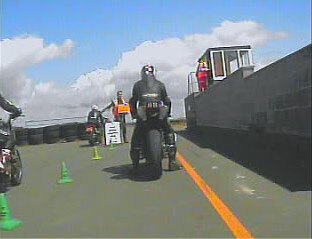 "I had a big off while using your bike camera at Cadwell. I was amazed that it all stood up to the hammering it got. The camera and DVR are still intact and useable." Watch Bill really test his 46Kam bike camera here! There is now a 4Kam in use on every continent around the globe. We're quite proud of that, plus it means we must be doing something right! By selling more of a smaller range (but of the most popular equipment) means we can get it just right and at a lower price for you too! The 46Kam Bike Camera is our special edition camera for bikers. The 46Kam uses the same high specification chipset as the 4Kam and is housed in the tough aluminum case. The difference between the two is that the 46Kam comes with special edition graphics in a Rossi-esque design making it that bit more special! To make things nice and easy we have put together a number of packages which include the most popular products. Although we've tried to simplify things for novice buyers that doesn't mean the equipment isn't top notch. Our Action Ready Package™ is popular worldwide and has a number of prestigious clients too including the BBC and Formula One™. The Action Ready Package™ is an all-inclusive ready to use helmet camera kit. It includes a bike camera, mini DVR and free bike cam microphone kit. The ARP is available with both 4Kam Motorcycle Camera and 46Kam Bike Camera. Same as the ARP above but with 2 cameras and a switch box. This means you can change between the cameras at the click of a button. 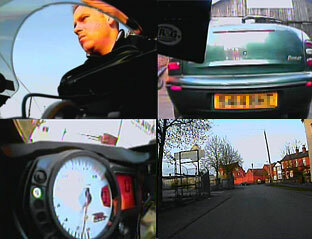 The Switcher ARP is available with both 4Kam Motorcycle Helmet Camera and 46Kam Bike Camera. If you need extras for your onboard camera such as a different helmet camera mount or a bike camera dc power supply then we have most things you could need, just check out what's on offer. If you use one of our bike cameras or onboard cameras then you're already a member of Team 4Kam, just email us your photo and we'll put you in the rouges gallery! If you could send us some footage too or a link to where we could find some that would be better still! If your looking for a bike camera for use in the nationals, a motorcycle camera to use in your championship or perhaps a bike cam for your charity trip then you may have a good case for 46Kam sponsorship. We do get many requests so please be patient!